Welcome to Kritter's Northcountry Campground and Cabins Little Lodge. We are located north of Newberry, Michigan. Your own private retreat with gas grill and picnic table. Relax in the privacy of our lodge or mingle with guests in the campground. 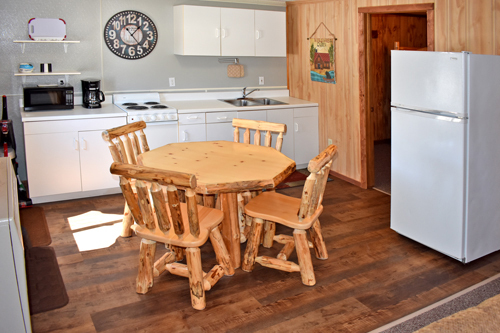 Guests of the Little Lodge have full use of the campground facilities. Enjoy a campfire at a nearby fire pit. Don't forget your hot dog sticks! Our Upper Peninsula Vacation Home and Snowmobile Lodging is situated in the heart of Michigan's Upper Peninsula, where you will find adventure just outside your door. Direct access to the trails. 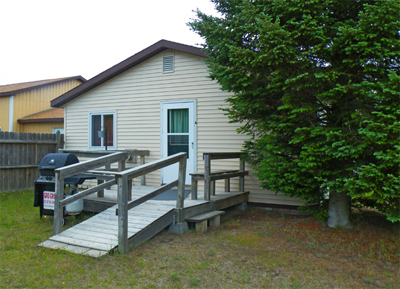 Your newly remodeled Upper Peninsula vacation home awaits. Completely updated in 2018! The first of the two bedrooms has a full size bed, a beautiful rustic red pine headboard and four drawer dresser, new artwork, full length mirror and carpeting. 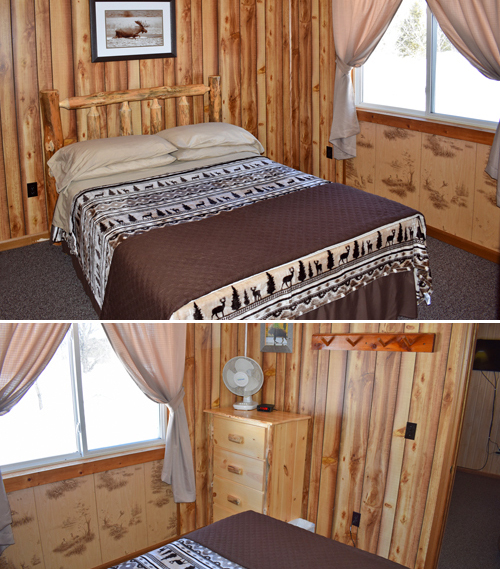 The second bedroom has a brand new set of white pine bunk beds, three drawer dresser, mirror and carpeting. Our large bathroom has fresh paint, new flooring, new mirror and a new dual flush toilet. In addition, the living room has a new rustic red pine sleeper sofa, red pine end tables, artwork, lighting and carpeting. There are also two reclining chairs and cable t.v. making this the perfect space to end a fun filled day! The full kitchen boasts new flooring, a new microwave and 12 cup coffee maker as well as an incredibly beautiful new rustic red pine kitchen table and chairs. It is also furnished with all you need for your stay, table service for 6, pots and pans, crock pot and utensils. Our UP Vacation Home is the perfect choice for families and groups sleeping up to six. 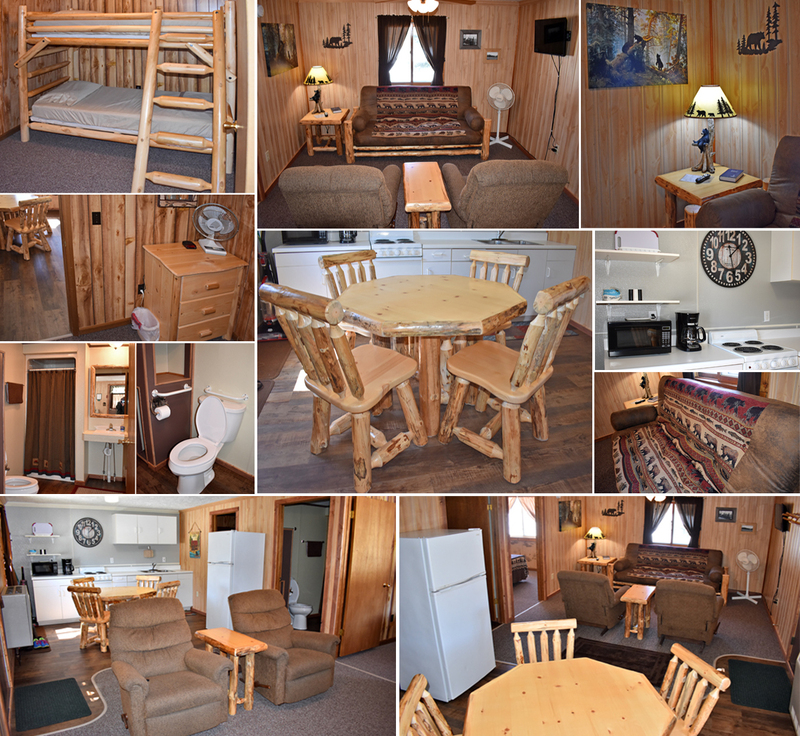 Our Little Lodge is sure to help make your Upper Peninsula Vacation the very best. PETS ARE NOT ALLOWED IN OUR LODGING. ONLY CAMPING GUESTS MAY BRING THEIR PETS. Bedding is provided. You will need to bring bath towels and your personal items. Enjoy our lodging in Michigan's Upper Peninsula! Reservations and deposit required. The balance is due upon arrival. The longer you stay the more you save, so please feel free to call for our rates and availability. We look forward to meeting you! "Decided to head north instead of south this year for our annual June vacation. Found this campground on the Good Sam website and decided to give them a try. Owners are great and the facilities are well maintained and bathrooms clean. Power supply to the sites is great and the water pressure and quality is good too. As stated (this goes for anywhere in the U.P. in June) - bring plenty of bug spray or call ahead to find a season when the bugs aren't as bad. This is some of the most beautiful scenery in the nation people! They are conveniently located in a central location for day trips to places like Lake Superior, Taquamenon Falls, Paradise Michigan, Newberry, Grand Marais, indescribably beautiful Pictured Rocks National Shoreline, Miner's Castle, Oswald's Bear Ranch, Toonerville Trolley, Pine Stump Junction, and other places that you should not go through life without seeing at least once. Saw a bald Eagle dip down into the water to catch a fish and my girlfriend caught a northern pike at Perch Lake. Perfect trip and perfect peaceful place to stay." The "RATES PAGE" has pricing for the campground. Please call our office for rates and availability for our cabins and Little Lodge. 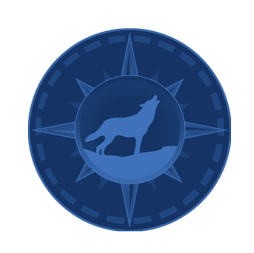 We invite you to check out our Little Lodge Photos by clicking the button to the right. Gallery offers larger view of each of the photos. 1/8 Mile North of 4 Mile Corner. Spring and summer office hours for phone calls and emails is from 8 a.m. to 9 p.m. Fall office hours are from 8:00 a.m. to 7:30 p.m. Winter hours are 9 a.m. to 6 p.m.